This is meant to be the year that Thailand’s junta finally rolls out elections, but already the government has been backtracking, plagued by one corruption scandal after the next. Among these is the trouble Prawit Wongsuwan, Deputy Prime Minister and Defence Minister, is in for not declaring more than a million dollars’ worth of luxury watches he says were borrowed from friends. Indeed, Wongsuwan’s defence is emblematic of the borrowed time the current coup-installed government has been living on. Perhaps to shake the unshakeable string of scandals, on Tuesday it was announced that local elections would be held this year, and that a meeting to discuss dates for the general election would be held. While it was previously assured the general election would take place before November, it is increasingly likely it will be pushed out for a fifth year, to 2019. 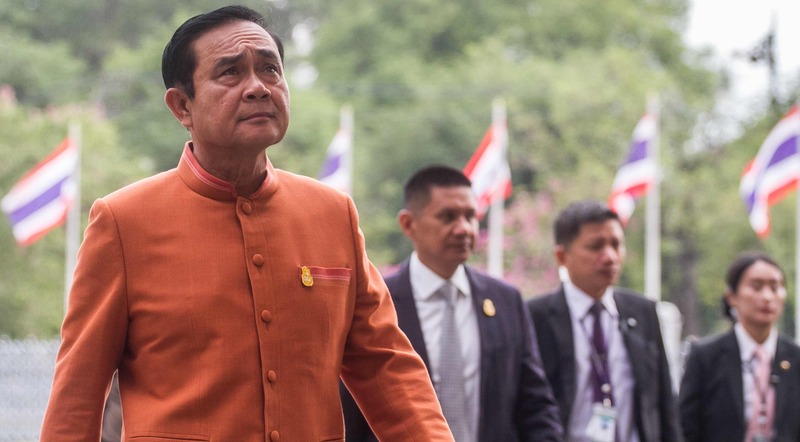 Amid the ongoing calls for swift elections, Prime Minister Prayut Chan-ocha has channelled the language of US President Donald Trump, saying he is putting “Thailand first” and that he will decide when elections are to be held. In a move that augurs poorly for transparency in an election year, General Prayut erected a cardboard cutout of himself to answer journalists’ questions. Meanwhile, the government’s enemy number one, the exiled Shinawatras, continue to frustrate the government. Photos that surfaced in January of the exiled former PM Yingluck Shinawatra shopping in London led Bangkok to announce it would request her extradition. Then on cue in February, a photo surfaced of Yingluck and her brother, exiled former PM Thaksin Shinawatra, shopping in Beijing. Prayut wasn’t pleased. It is yet another headache for Prayut’s embattled government, which promised to break Thailand’s political deadlock and bring stability. Since coming to power in the 2014 coup, stability has been enforced, but Prayut’s government has done little to build the independent institutions necessary to extract Thailand from its long-drawn political turmoil. The main problem is that the military long ago decided who they want to win the election; or rather who they don’t want to win. The junta wants to split the pro-Thaksin vote. Supporting new pro-military parties has been floated as one way for the government to achieve this. They will be among the 100 new political parties expected to launch when registration for the elections opens in March. Among them is former protest leader Suthep Thaugsuban’s the Great Mass of People Party, and the pro-military Public State Party. Some suggest Suthep, who was acquitted this week of defamation, will back Prayut for another term as prime minister. Thaksin has also been publicly manoeuvring abroad to demonstrate that the Pheu Thai Party is still a fighting force. However, under the military-drafted 2017 constitution, his involvement may be enough for the junta to dissolve the party. That would be a short-term victory for Prayut, but how it played out in the long-term and at the ballot boxes would be less certain, and potentially very volatile. Regardless of which parties contest, the military’s Internal Security Operations Command (ISOC) will “monitor” the elections (see this great backgrounder on the history of ISOC). This “oversight”, combined with an alliance between pro-military parties, particularly those that have successfully picked off former pro-Thaksin MPs, may hand victory to a pro-military, anti-Thaksin government. In the case where a deadlock remains, under the military-drafted 2017 constitution an unelected individual, such as Prayut Chan-ocha, could be appointed prime minister. Neither outcome is likely to bring stability. (See this excellent round-up of possible scenarios). For many outside observers, elections can’t come soon enough. Bangkok has shifted closer to China in recent years, and elections, some hope, may pull a future government back into the orbit of the US. An excellent report by John Blaxland and Greg Raymond published in December shed light on the current balance between Thailand, the US, and China. Among other takeaways, it showed that China has eclipsed US influence in Thailand, supported by a strong historical amnesia of Beijing’s Cold War interference in the country. The fact that half of the 1800 Thai officials, mainly military, interviewed for that study were Major or below in rank suggests that these views may indeed be the future. In this new environment, and likely hoping to encourage elections, the US doubled the number of officers participating in February’s Cobra Gold Exercise. “[The Exercise] is the symbol of America’s unwavering commitment to Thailand and the peace and prosperity of the Southeast Asian region”, noted the US Ambassador to Thailand Glyn Davies. Importantly, despite the increase, it was still only half the size of pre-coup exercises. On the eve of the coup d’état in May 2014, I wrote from Bangkok that the situation was now on a knife-edge, and asked, “Muddle through or military coup?” I was wrong on one count: the conjunction. Almost four years on, the military coup has been one drawn-out muddle through. To move on, Thailand should start with the rebuilding of independent institutions and the holding of free and fair elections. Unfortunately, it’s odds-on that the muddle through will continue. Highlights of The Interpreter from the lead up to the Foreign Policy White Paper and the reactions after.